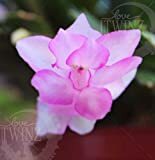 Christmas cactus for sale in the market is typically a cutting grown from a stem tip of a mother plant. This plant will remain in flower for four to six weeks, with each flower lasting six to nine days. Blooming time is from late November to late January, they give a wonderful Christmas display or are an ideal Christmas gift, hence its name. 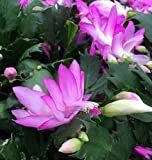 The Christmas cactus is a short day plant; it blooms when nights are at least 14 hours long and daylight periods are between 8-10 hours for 6 weeks. In order for the plant to form flower buds for holiday blooms, it needs extended darkness for at least four weeks prior which can be mimicked at home. 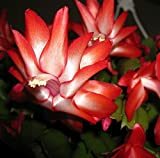 Location – The Christmas cactus will adapt to low light conditions, but the plant will produce blooms more readily if exposed to brighter light. However, avoid placing it under direct midday sunlight which will burn the leaves. Select a location with high humidity with temperatures of about 60 – 70 Fahrenheit. Soil – Keep your Christmas cactus pot-bound with a sandy soil. Adequate drainage is necessary to prevent root rotting. You may combine 1 part potting mix and 1 part fine-grade fir bark. Improve humidity by using gravel-filled saucers to place your plants upon and keep this moist. 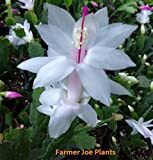 Water – Irrigating your Christmas cactus should be done frequently and thoroughly, keeping the soil moist but not saturated. Allow about the top inch of soil to dry before watering again. When buds appear, increase the number of times that you water, but not the volume of water used. However, during the winter months, this plant should be kept on the dry side, withholding water for six weeks. Fertilizer – A water-soluble fertilizer recommended for flowering houseplants can be applied during its active growth. Feed every 2 weeks with a balanced liquid fertilizer diluted by half. After blooms have dropped, stop fertilizing for a month. The fertilizer you use should have a nitrogen ratio of no higher than 10 percent. Pruning –After the plant has flowered, prune back each stem by pinching off enough sections to achieve a uniform habit. Remove the tips and a few of the oldest and most damaged stems to help the plant bush-up. Always remove whole segments of the leaf-like stems; this will leave you with a nicer looking plant. Do not prune beyond mid-summer. 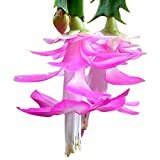 Problems – The Christmas cactus is pretty much pest and disease free except from mealy bug which is a common pest. However, you may experience shriveling of the stems caused by the plant being in too hot and sunny situation. It could also be caused by over or under watering. Non-flowering could be due to the day length not shortening or/and the temperatures not dropping to mimic autumn. Christmas cactus can also be prone to bud drop, so avoid extreme environmental changes. Keep them away from drafts or heat sources like fireplaces or television. Propagation – Take stem segments in spring and place upright in moist perlite.